Data from the New Horizons mission have revised Pluto’s diameter to just 2370 kilometers across. That’s smaller than the moons Triton, Ganymede, Callisto, Io, Europa, and Titan, not to mention Earth’s own satellite. 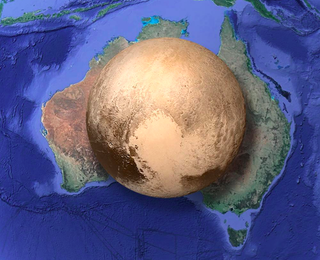 In more immediately relatable terms: Here’s what it would look like if someone plopped Pluto onto Australia. Please leave your jokes about Australia being only slightly more hospitable than Pluto in the comments section, below. Contact the author at rtgonzalez@io9.com and @rtg0nzalez.